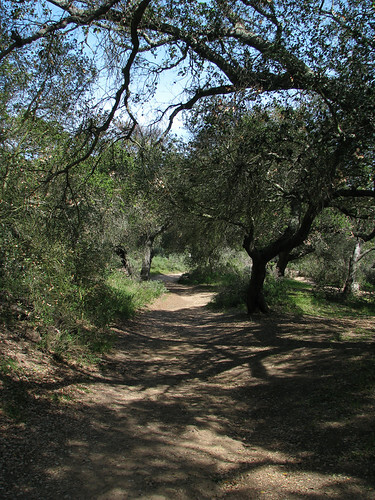 Charmlee Wilderness Park, run by the City of Malibu Parks & Rec Department, is one of those little gems in the Santa Monicas that makes for a quiet, easy day. 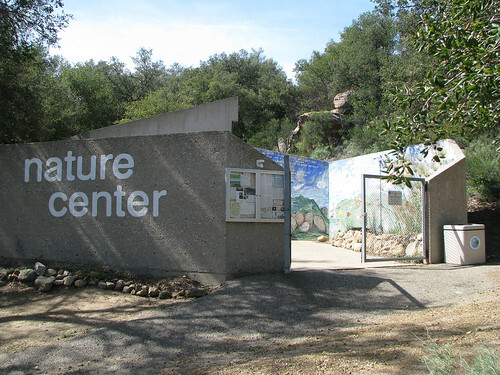 It’s generally not too crowded, has a nice little nature center, a great picnic area under old oak trees, and hiking trails that can be hiked (well, more wandered really) by people of all ages and abilities. I’ve detailed a short 2.1 mile hike below, but the total trail mileage in the park is about 8 miles. 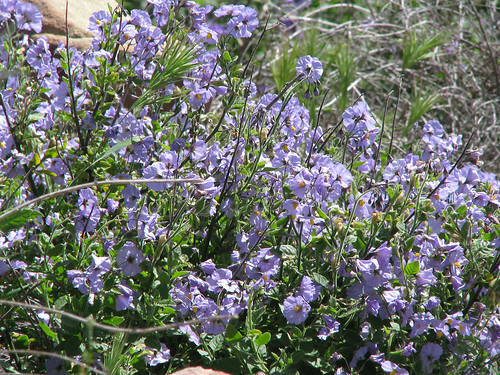 The hike and pictures below are from a couple of weeks ago. 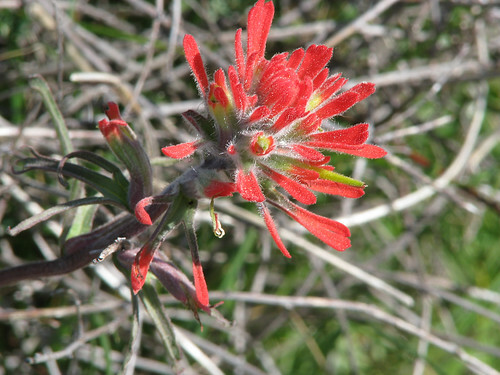 The park right now is green and starting to get its crop of spring wildflowers, which makes right now a great time to visit, but don’t let that stop you from traveling there any time of year. After parking in one of the two dirt parking lots and paying the $3 entrance fee at the iron ranger, proceed past a couple of picnic tables along the road. 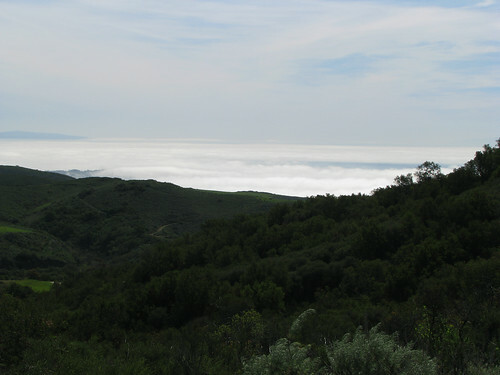 From here, you’ll have a view over the canyon and out over the pacific beyond which, when I started, was covered in a layer of fog. The road will turn right at an informational signboard, where you’ll find placards about local wildlife and wildflowers and park maps. You can turn right here and follow the road a short distance up the hill to the nature center. Past the nature center, the road continues up the hill and around an old watertank, but our trail goes straight past the informational signboard and through the oak-shaded picnic area. We then angle uphill to a four-way trail junction near the top. Ahead is a rocky outcropping and the remains of the old ranch house that stood here. To the right is the trail coming down from the tank hill. Turn left and proceed down into the grassy flats. Continue downhill and turn right at the first junction, heading through the meadow, covered in spring by green grasses and wildflowers. 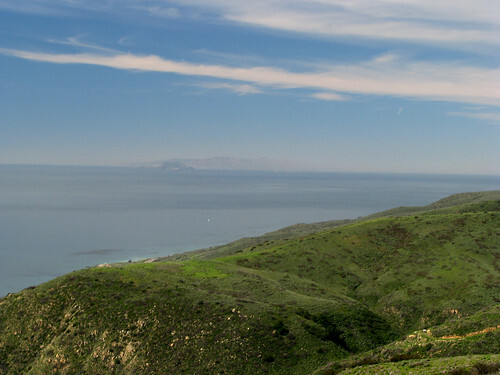 Crossing the flats you’ll arrive at the bluff, affording good views out over the ocean, spanning from Palos Verdes in the south to the Channel Islands in the north. The trail to the right will take you to an oak glen, but we’ll turn left and go a bit more uphill to an old concrete reservoir. 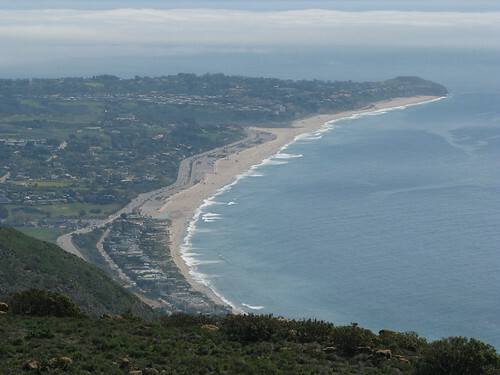 From here you can look down towards Point Dume and Zuma Beach. Rounding the pond, angle left back towards the meadow, heading downhill. 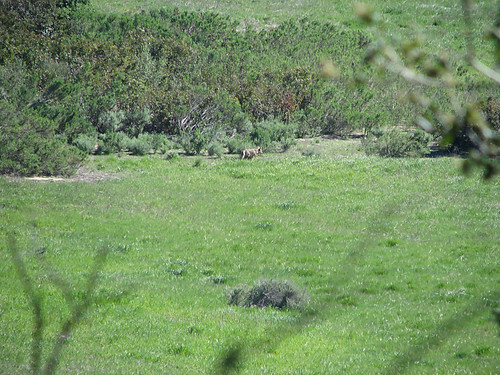 It was at this point I caught sight of a coyote, staring at me before disappearing off into the brush. I barely got of one shot before he was gone. Later in the afternoon while lazing about at my picnic spot he appeared again, wandering across the field. What I love about this is that I saw hikers crossing the meadow all day, completely oblivious to him being in the brush nearby. Sometimes the wild is a bit closer than we think, and he went about his business without being disturbed. 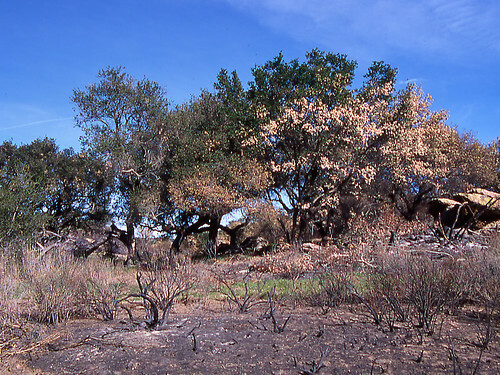 Continuing along the trail, you’ll cross through a shady oak glen. Past the oak glen, you can angle left and back up hill to the four way junction, or continue straight, which will take you back to the picnic area. My suggestion: bring a good lunch, pick up a park map, and explore. More ’03 photos are on the Flickr site here as well. Directions: From Highway 1, turn north on Encinal Canyon Road and drive 3.8 miles to the park entrance on the left. From the 101, exit at S. Westlake Blvd (County Route 23) and drive 7.9 miles south (the road will turn into Decker Canyon Road), turn left onto Encinal Canyon Road and drive about 1.3 miles to the park entrance on the right (the roads are a bit of a maze in places, so if you’re coming from the 101, check your map first). I think I’ll try giving it a shot the next time I’m out. Looks like you’ve been playing around with the Macro function of your new camera. Nice pictures, as usual. 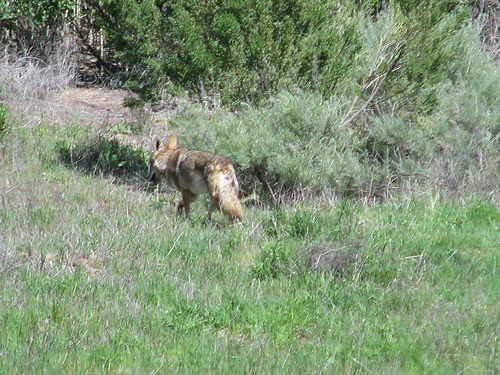 We saw a coyote on the way to LAX on Tuesday. I’ve heard them on the trail but I’ve never had the pleasure of seeing one. just a girl – you would prefer “kiosk” perhaps? charlotte – Thanks. 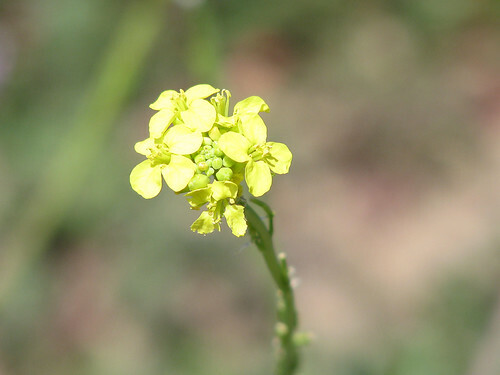 Be sure to send pictures of the eastern flowers! pneumoniaBoy – I’ve thought about it, but it would just be that much more work on a hike! Homer-Dog – Would you believe I’ve had batter luck stepping back & zooming out? I’ve seen coyotes wandering along the roads in the Santa Monicas without a care in the world. Hopefully you’ll see one eventually. Backpackermomma – 🙂 Hopefully spring will reach you soon!